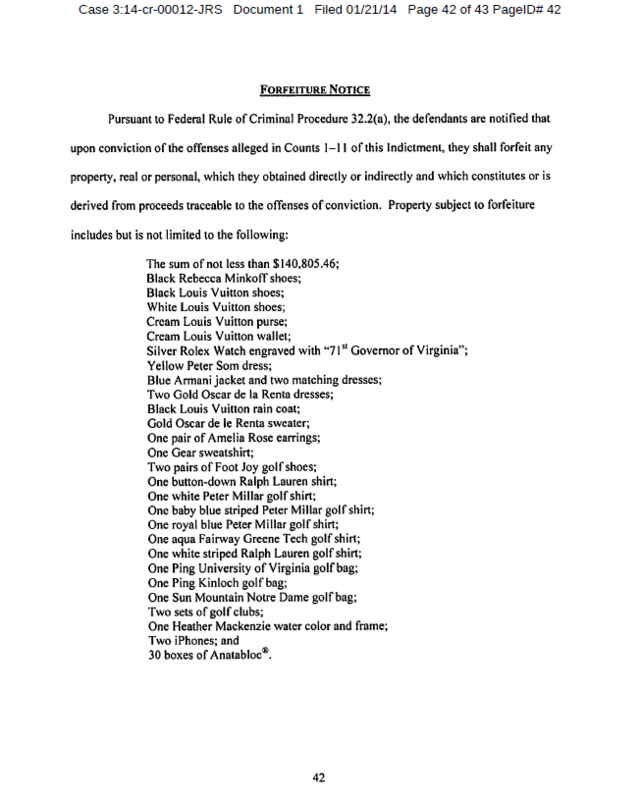 Gifts valued at a minimum of $140,000 in total included designer clothes, a Rolex watch, golf clubs, iPhones and a painting, according to a list of items included in the indictment. McDonnell, who in a statement denied any illegal conduct and called the charges federal government overreach, was elected in 2009 and left office earlier this month after serving one term. Virginia governors cannot serve consecutive terms. "I come before you this evening as someone who has been falsely and wrongfully accused and whose public service has been wrongfully attacked," he said in a televised statement. The federal probe involved the relationship between the governor and his wife, Maureen, with Jonnie Williams, the chief executive of a troubled nutritional supplement company, Star Scientific. Authorities allege that Williams gave gifts and loans to the first family of Virginia, and that they promoted his company. McDonnell admitted to poor judgment in an earlier written statement. "I deeply regret accepting legal gifts and loans from Mr. Williams, all of which have been repaid with interest, and I have apologized for my poor judgment for which I take full responsibility," he said. "However, I repeat emphatically that I did nothing illegal for Mr. Williams in exchange for what I believed was his personal generosity and friendship," he added. McDonnell's Democratic successor, Terry McAuliffe, issued his own statement after the charges were filed. "As this case progresses, it is my sincerest hope that justice will be served and that Virginians get the answers to which they are entitled," he said. "As Governor, I will remain focused on leading this Commonwealth in a way that restores Virginians' trust in government and honors their expectation of transparency and accountability." Within hours of the indictment, McDonnell's legal team launched a forceful attack on the government's case. The lawyers made two legal filings in federal court in Richmond, one of which invoked an ancient ruler whose tyrannical reign was reputedly marked by financial greed and misdeeds. "It has been a long time since the Roman Emperor Caligula imprisoned people for violating laws written in tiny lettering on a pillar too high to see," the lawyers wrote in making a comparison to the federal government's case against McDonnell. McDonnell's lawyers argued his innocence and said the charges were built on a "rickety legal foundation." "To bring today's indictment, the federal government has concocted a never-before-used legal theory manufactured for the sole purpose of prosecuting Governor McDonnell and his wife," McDonnell's lawyers wrote. "This new theory contravenes settled judicial precedent and disregards longstanding Virginia law and practice, seeking to punish the McDonnells for conduct that was legal before today," the lawyers said. The McDonnell legal filings said Williams is under federal investigation for some of the health claims his company made for its products. But the government has offered "blanket immunity" in exchange for cooperation in the McDonnell investigation. Appearing on CNN's "Crossfire," former Virginia Attorney General Ken Cuccinelli said the indictment was not a surprise considering the public attention the investigation received. He believes the charges will "cause challenges" for Virginia. "We like to think of ourselves as a pretty smooth-running, clean state. Doesn't mean everything goes the way we want it to all the time - this puts a dent in that and that's not something we're happy to see with the history we've got, which has been pretty darn good," he said. Cuccinelli, a Republican who served under McConnell, lost the governor's election in November to McAuliffe. It's always some rich "Developer" who gets these politicians in trouble. Here's a former governor getting trounced and maybe even earning some white collar jail time, and the guy who screwed him up moves on to the next politician he can buy. "Hello Chris Christie!! Have I got a great idea for a waterfront development!!!" Shut the h3ll up about Begazhi and fix the murders in Chicago. Funny. Brought to you from the party of holier than thou. It's just amazing when they they get a dose of their own medicine. Best story I read all month! Good thing Virginia governors are limited to 1 TERM. Can you imagine how much many more "gifts" this guy could have received given a second term. As crooked as all of the other worthless politicians. Well, well, well now Bob, how does that "PROBING" feel? Hahahahaha!!! Greed is the downfall of most powerful people! Moral of the story. Don't elect someone who can't manage his own finances and don't elect anybody that stupid. As we say in Chicago, this guy forgot to pay someone. What a suprise. Who would have ever thought that a gop politician would have dirty dealings under the table? That's right, everyone. This is how they operate every day of the week. Then scream when they get caught that it's "not what it looks like". Exactly why the gop is sliding off the face of the earth.